Trifid Nebula (Messier 20) is one of the nearby HII regions providing good opportunity to study stellar formation. 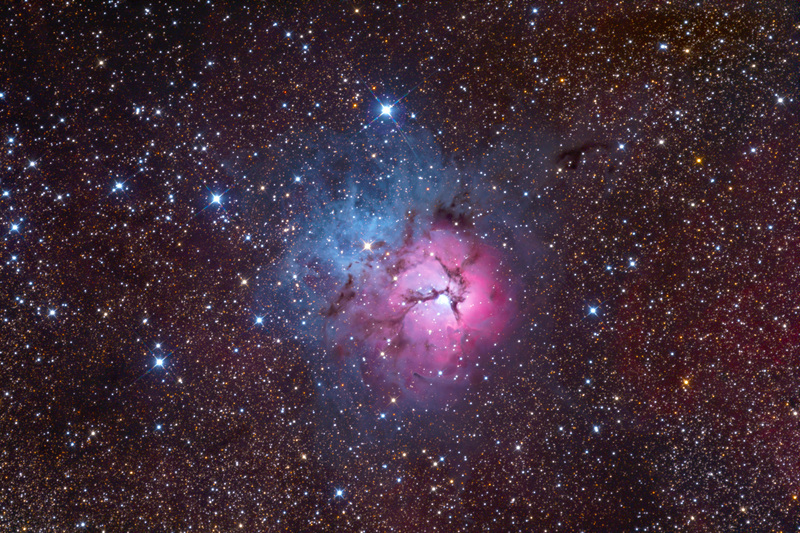 Trifid Nebula was discovered by Charles Messier in 1764, and listed in his famous catalogue under the number 20. The name of the nebula means "three lobed" because dark nebulae in front of the red glowing emission region seem dividing it into three parts. These dark nebulae are referred to as Barnard 82. The approximate distance of the complex consisting of interstellar gas- and dust cloud and an open cluster of young stars formed of the cloud is about 5200 light-years. Some parts of the nebulosity are reflecting the light of young stars in front of the nebula, these parts appear blue because the young stars are shining blue. This kind of nebulae are called -not surprisingly- reflection nebulae. The red glowing part of the cloud is emitting light, because the strong ultra-violet radiation from the young stars within the nebula are ionising the hydrogen (in which the nebulosity is quite rich). Ionised hydrogen particles emit photons, which we observe as the red glowing. Emission nebula is the term used for this kind of nebulae. The dark stripes in the picture are not gaps as one could think, but thick dark nebulae in front of the reflecting or glowing nebulae blocking their light. There is an open cluster of stars associated with the Trifid Nebula, containing stars that were formed of the cloud. Trifid Nebula has quite a lot similar properties to the Great Orion Nebula (Messier 42), however their age is different: while the Trifid Nebula is only 300000 years old, the Orion Nebula is 5 times older. Several pillar-like dark clouds pointing towards the bright central star can be observed in the image, these are evaporating gas globules (or EGGs). Their tip is dense enough to block stellar wind of the central star, acting as a shield for the much thinner gas behind them. That's the reason why EGGs are pointing towards the central star. However the tips are able to resist the stellar wind, they can't stand forever. They are being slowly evaporated by the violent radiation of the star. As the stellar wind and the radiation are interacting with the globules, pressure and temperature is increasing in them, especially near the tip. Increased temperature, pressure and the dense gas leads to stellar formation. There are a few thousand newly formed stars known in the region. In 1999 Hubble Space Telescope was pointed towards M20 and discovered a stellar jet sticking out of the tip of a globule. The length of the jet is about 0.75 light-years. The originator of the jet is a young stellar object hiding in the globule, continuously growing by drawing the surrounding material by its gravity. In 10-20000 years the globule will be eroded by the central star of M20, and the young star will be revealed, unfortunately by that time there will remain no supply for the growth of the object, and the jet will disappear. The jet can also be observed in the photo. 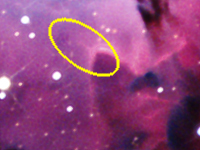 To make it easier to spot, a contrast enhanced version can be seen on the right, in which the jet is marked by the yellow ellipse.